Peoria Chiefs RHP Mike O’Reilly and Fort Wayne TinCaps RHP Michel Baez were dominant in their respective games Monday, and will face off against each other at Peoria’s Dozer Park on Sunday if their teams stick to an unaltered five-man rotation through next weekend. Of course, it’s possible the St. Louis Cardinals will promote O’Reilly before then, considering his dominance of the Midwest League this season, and the fact that there’s usually a lot of player movement after the draft signing period ends. Baez, on the other hand, made only his third start of the 2017 season Monday, so he’s sure to still be with the TinCaps next weekend. 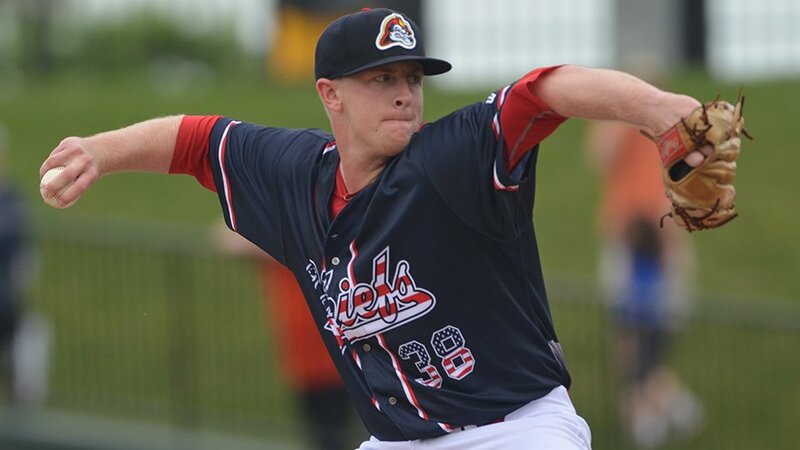 O’Reilly pitched a one-hitter against the Cedar Rapids Kernels for his second nine-inning shutout of the season. He struck out 12, walked none, and extended his scoreless streak to 26.2 innings. The Midwest League All-Star is now 8-2 with a 1.56 ERA, 79 strikeouts and 10 walks in 80.2 innings (14 games/11 starts) this season. The Chiefs won Monday’s game 3-0, getting their first run on an inside-the-park homer by Stefan Trosclair. Baez also allowed only one hit in his Monday outing, but also walked a batter in his six innings of work against the Lugnuts. He struck out seven. He got plenty of run support from his teammates as Fort Wayne downed Lansing 13-4. Reinaldo Ilarraza went 4-for-5 with a double and two RBI. Jorge Ona went 3-for-5 with four RBI. Hudson Potts went 2-for-5 with a home run and three RBI. 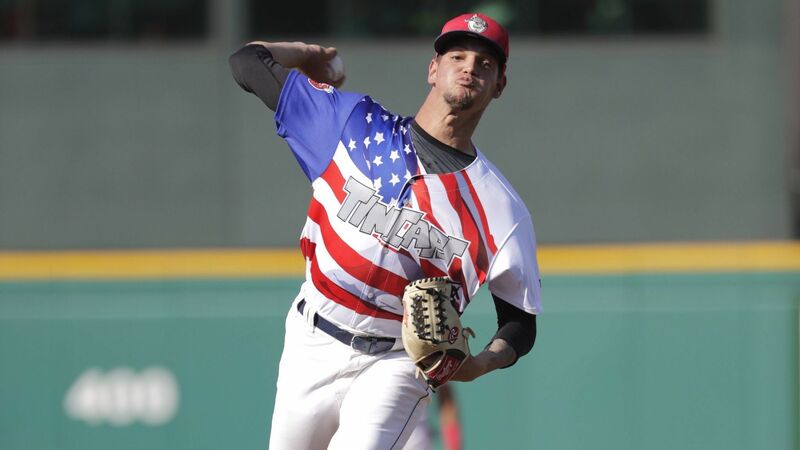 Baez improved to 2-0 with a 0.00 ERA, 16 strikeouts and one walk in 11 innings/two starts for the TinCaps. The San Diego Padres prospect also made one start at rookie-level this year. Three other games were played in the Midwest League on Monday afternoon. The Bowling Green Hot Rods beat the Great Lakes Loons 9-1 to win their ninth consecutive game. That ties a team record. Hot Rods starting pitcher Willy Ortiz got the win, allowing one run on three hits and four walks while striking out four batters in seven innings. He improved to 4-1 with a 3.83 ERA this season. The Beloit Snappers beat the Kane County Cougars 3-1 to end their losing streak at six games. Beloit’s Kyle Nowlin went 2-for-3 with a double, a walk, and two RBI. The Burlington Bees beat the Wisconsin Timber Rattlers 6-3. Sam McDonnell drove in two runs for the Bees, and Trever Morrison knocked in two for the Timber Rattlers. This entry was posted in Beloit Snappers, Bowling Green Hot Rods, Burlington Bees, Cedar Rapids Kernels, Fort Wayne TinCaps, Great Lakes Loons, Kane County Cougars, Lansing Lugnuts, Midwest League, Peoria Chiefs, Wisconsin Timber Rattlers. Bookmark the permalink.